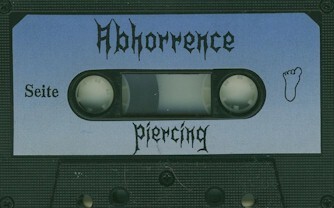 Abhorrence is a death metal band from Sindelfingen, Germany. Members were Olli - Vocals, Stephan Tecklenberg - Guitar, Peter - Guitar, Horst - Bass and Habli - Drums. Pro printed covers. Lyrics on back. Recorded onto pro tapes that had stickers on the shell.